When homeschooling ADHD, your homeschool day will not look like the homeschool schedule of anyone else. Kids with ADHD need structure, but also flexibility and room to move. If you start your homeschool year with the belief that your kids will sit still at the table working on school for five straight hours, you will definitely be disappointed. 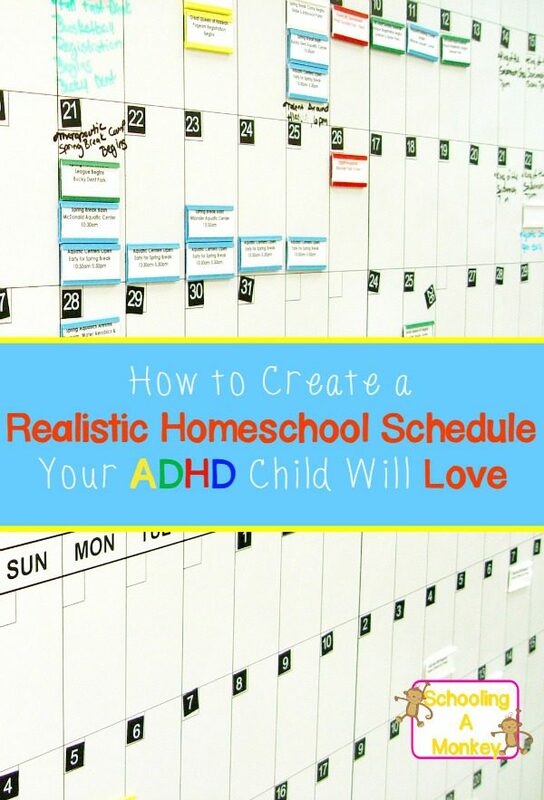 Instead of creating a homeschool schedule that will frustrate everyone involved, use these tips to create a realistic homeschool schedule that your ADHD child will love. 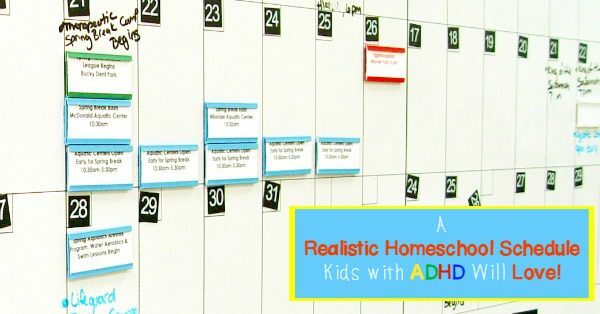 Use these tips to create a realistic homeschool schedule that works well for homeschooling children with ADHD. If I don’t catch my ADHD kids when they are willing to work, we might as well forget learning anything that day. But luckily, there is a specific time of day when Monkey and Bo are willing to learn. Monkey typically is ready to learn between mid-morning and late afternoon, so we do most of our school during that time. If I tried to get her to do school early in the morning, she would learn nothing and get frustrated and upset. Some kids with ADHD may prefer learning early in the morning to get it all out of the way (I was like that) and some might prefer learning at night (my husband was like that). If you can find your ADHDer’s “golden learning hour” then your homeschooling journey will be so much easier. 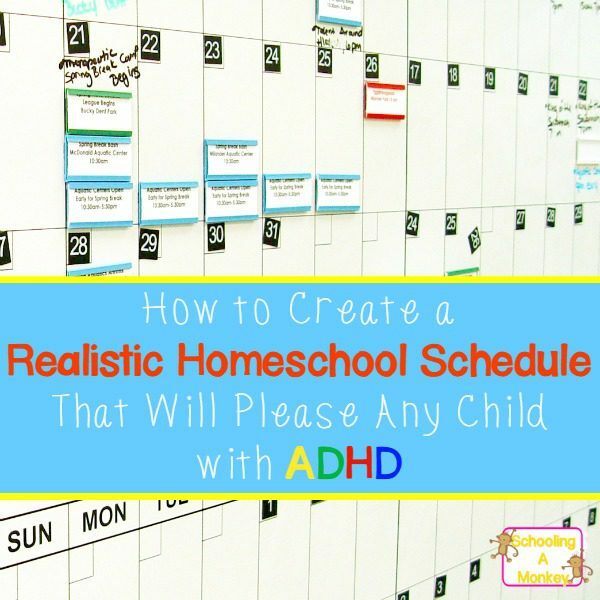 Part of creating a realistic homeschool schedule that works for ADHD is to involve your children in the homeschool planning process. I let Monkey chose the order of her school work. If we have lessons that only take place once or twice a week, I let her pick the days when we do those lessons. Letting her take control of the schedule helps her feel like she is valued and in charge of her day. As a bonus, letting them plan their day helps teach time management skills, which many kids with ADHD lack. I mean leave wiggle room quite literally. If your child has the hyperactive form of ADHD and not just ADD, they will need to move. Sometimes I wonder how Monkey can learn math facts while standing on her head, but it works for her. Fighting the wiggles is equivalent to trying to prevent the tide from coming in. You might eventually be able to do it, but you will feel exhausted. I usually let our kids take movement breaks after every subject and I try not to fuss too much if they wiggle around during lessons. I also provide fidget toys, but sometimes they cause too much of a distraction so we have to put them away. I don’t know if every child with ADHD is like this, but it is true in our family. We really like our routines. We like to plan our day and stick to it. Even vacations are planned. When something happens to upset the plan, we get frustrated, bored, and a little bewildered. Monkey is the same way with school. Once, I tried to move her math lesson from the morning to the afternoon and her world was turned upside down. It took about two weeks for her to adjust to the new schedule. For us, completing work in order is more important than a specific time schedule (although Monkey likes starting at the same time each day). Having the routine in place helps Monkey know what to expect and keeps her from getting as overwhelmed and frustrated by things she isn’t expecting. Monkey thrives on visual progress trackers. My siblings and I were the same way. We all find visual progress trackers highly motivating. Reward charts, bonus point trackers, and checklists make us happy. My mom used Sing Spell Read and Write with most of my siblings when they were learning to read, and it was that silly race track and box of treasures that helped us want to learn to read, even though sitting still was torture for most of us. So, if you can create or find something that visibly tracks lessons completed or shows that your ADHD child is working for a goal (like a trip to the ice cream parlor), that will make a huge difference in their focusing power and attention to lessons. Even though routine is important in our ADHD homeschool, flexibility is equally important. Flexibility is more important on the teacher side than the student side. I have to take care not to overwhelm her with too much new information at once. If I see that Monkey has had enough for the day, I have to make the decision to stop or push through and risk triggering an outburst of frustration. This can make lesson planning more of a challenge, but sometimes just moving from one subject to another for a few minutes is enough of a reset so we can come back to the original subject later that day. 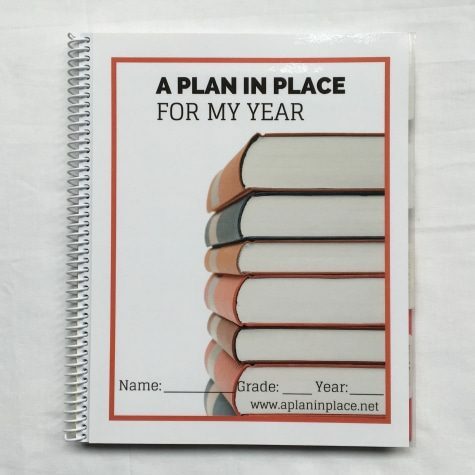 Although we have tried digital homeschool planners in the past, I prefer planners I can write on with a pen. 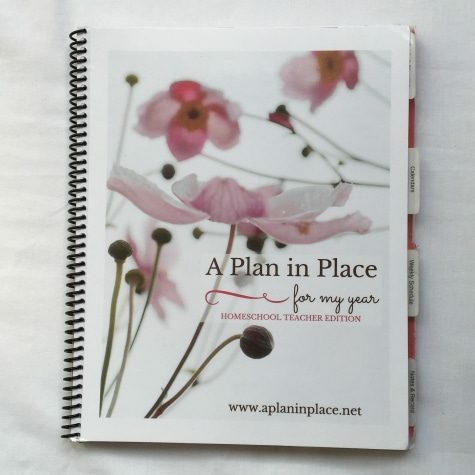 We’ve found that these printable homeschool planners offer the flexibility that we need for our ADHD homeschool. 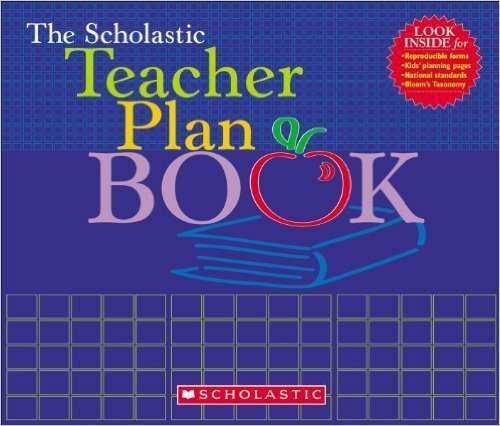 These planners are easy to edit when you are drafting your realistic homeschool schedule. Read the rest of the homeschooling ADHD series here!